We thought we'd be doing ourselves a favor by slowly building up to this one. 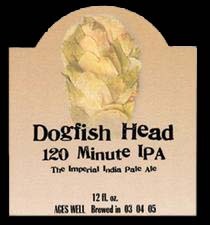 We started off with a 60 Minute IPA, moved to the 90 Minute IPA, and felt fully prepared to take on the 120. What we got, we were not prepared for. It pours a medium amber color that settles a dark amber color with a cloudy body. A small, fizzy white head invites us to explore. Immediately omnipresent is the strong sweet aroma of peaches and apricots with a harsh hop nose. Initially, the taste is moderately sweet, but we were whisked away into a heavy sweet finish with heavy carbonation, which was unable to subdue the harshness of the sweet hit. Despite the heavy sweetness, there is a heavy bitter mouthfeel, giving a bit of balance to the beer. Medium weight on the mouth, it has an oily texture with heavy carbonation. Reviewed on January 6, 2007 with guest reviewers Thirsty Beard, Scott, Erin, Wood, Kat, and The Doggfather.